These two sentences sum up the content of the book very well. From vessels to pods, folded surfaces to embellishments, June Barnes presents a wealth of information. Chapters provide in-depth information about the manipulation and embellishment of textile surfaces. This leads to manipulating the plane by weaving strips, coiling, folding, gathering, and smocking. If your interest includes stacking and layering, curling or wrapping you cannot ignore this resource. My personal interest is in three dimensional shapes. Barnes introduces squares and circles and how to successfully integrate these. Platonic and Archimedean solids, spherical shapes and orbs, crescents, pyramids, prisms, cylinders and capsules are all presented with detailed sketches alongside the completed work, making it easy to find a starting point for one’s own work. A Featured Artist Gallery completes this invaluable resource, sure to spark new ideas and a possible body of work that pushes the boundaries. I ordered my copy from Amazon.ca for well below the suggested retail price of US 26.95 (Can. $ 29.95). 07 Apr	This entry was published on April 7, 2014 at 1:24 pm. 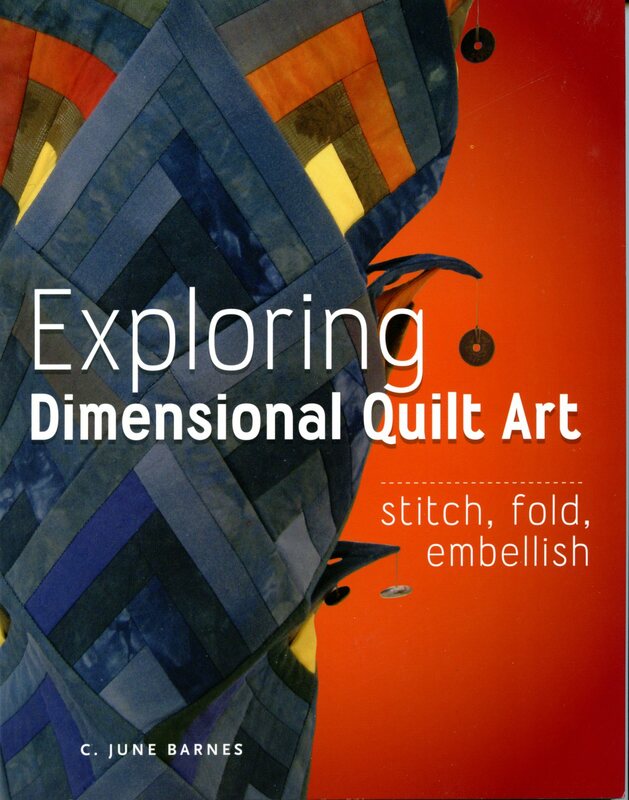 It’s filed under Art, Book Review, Creativity Update, Design, Journaling, Sharing Resources and tagged Art Quilting, book review, C. June Barnes, dimensional quilt art, Interweave Press, manipulating fabric. Bookmark the permalink. Follow any comments here with the RSS feed for this post.